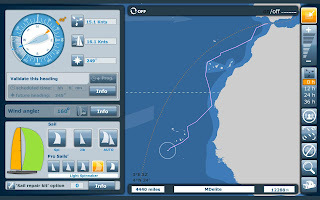 Here we are almost a week since my last post and I am still sailing in the Volvo Ocean Race Game. True to my word, I have stayed the course and not bought any options. The boat doesn't change course unless I grab the wheel and do it myself. First thing in the morning, a little before five (I work early) I get up, set up the coffee maker, and check my progress. I'll tweak my course and re-set my sail if it has become worn, checking what the future wind may be. Off I go to the office. I ignore it all day and check it first thing when I get home. This is when I set my strategy for the next 24 hours. I scour the GRIB files, looking for a path with some good wind. Pretty much, I end up just guessing. I'll check back a few time through the evening and tweak, ending with a final course setting that should get me through the night without hitting land. It is definitely not an adrenaline rush, but there is a lot of satisfaction seeing the long term progress. From a start around 16061st place my boat has steadily moved up to 12288th. Still 4400 miles to go. The end of the race won't find me in the winners circle, but my results are encouraging. I'm pretty confidant that I'll do just fine when I get to start with everyone else.